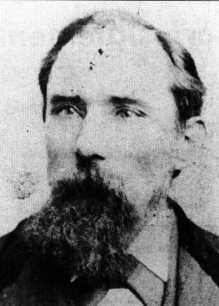 On this date in 1878, John “Black Jack” Kehoe was hanged in Pottsville — as Pennsylvania’s anthracite trusts took a victory lap around the corpses of the Molly Maguires. Even to say what the Mollies were is to take a side in their life-and-death struggle. Irish immigrants fleeing the potato famine had poured into Pennsylvania’s coal mining country in the mid-19th century, where life in the mines was nasty, brutish and short, and the pay wasn’t anything to write home about either. In a time when capital ruthlessly hunted any intimation of labor organizing and the Irish were a distinctly second-class people, the (apparent, or at least alleged) response of the Mollies was natural: form a secret society, and wring by threat of bodily harm the concessions it could not pursue by collective bargaining. For the recent Irish transplants, the tableau of a Catholic underclass working for a Protestant landlord who owned (and gouged on) everything in sight had a certain familiar feel. Terrorists? They certainly used violence to achieve political objectives, at least if the testimony of their foes is credited. But they weren’t the only ones. Mine owners turned public and private violence on Irish radicals pushing for things like the eight-hour day. The notorious strike-breaking Pinkerton Detective Agency was detailed to infiltrate the Mollies. The main blow against the Mollies was struck over a period of (extrajudicial) vigilante justice in the mid-1870’s, culminating in “Pennsylvania’s Day of the Rope” in 1877, when ten supposed members were (judicially) hanged around the Keystone State. Kehoe, a power broker in mining country with some sway at the capital who was reputed to call the shots among the Maguires, faced the hangman singly a year later for an 1862 cold-case murder so doubtfully ascribed to Kehoe that the governor hesitated to sign the death warrant. The lesson taught by the punishment of the Molly Maguires would have been shorn of much of its terror and impressiveness if the energetic and persistent efforts made in behalf of KEHOE, the reputed king of that organization, had resulted in rescuing him from the gallows. If they had even so far succeeded as to have caused his punishment to be commuted to imprisonment for life, the admonitory influence of his fate upon the murderous clain of whom he was the last surviving chief would have been greatly lessened, and the snake of Molly Maguire-ism, of which he was the forked tongue and fangs, might haply have been only scotched, not killed. … The law has shown that it has subtlety enough to hunt [the Molly Maguires] through every possible labyrinth of refuge and strip from them every artifice of disguise, and power enough to wring them out of the desperate grasp of sympathizing constituencies and crush them. Pennsylvania Gov. 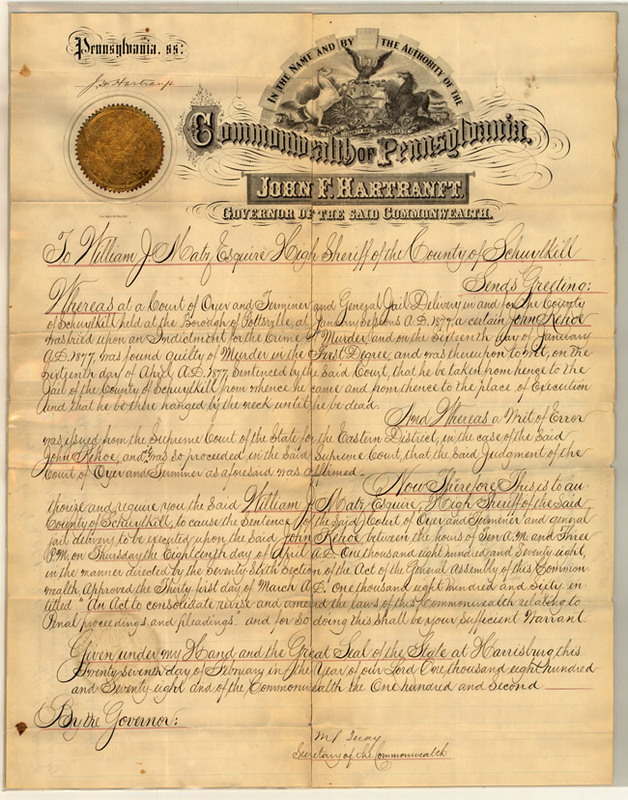 John Hartranft left office a few weeks later, and reflected in his outgoing address on the lessons “the manufacturers and operators” ought to draw from the late unpleasantness. The Mollie Maguire murders, like the agrarian murders in Ireland, and the trades-union outrages, arsons, and machine-breakings in England, were not the work of the so-called criminal classes. They were essentially class murders … If some of the leading spirits of the class had been members of a board of arbitration as representatives of labor, with some of the employers or their agents as representatives of capital, it is not unreasonable to suppose that most of the disagreements that have kept the coal regions in a state of turmoil might have been amicably adjusted, and many of those who were assassinated and of those who have been hanged living to-day. 101 years later, Kehoe received what was thought to be the first and only posthumous pardon in the state’s history. The Mollies’ true extent, purpose and actual actions — even their very existence as anything but a stalking-horse for the more thorough conquest of surplus labor — remain hotly debated to this day, since the public record of this tight-lipped society consists of little beyond the courtroom testimony of a handful of parties thoroughly prejudiced to hostility by class interest or payoffs. * Written by Walter Bernstein, who had only recently emerged from the Hollywood blacklist for his Communist proclivities. Awen,ever heard of the MAFIA? The fact is the Irish were the nation’s first terrorists. Never or rarely saw this hostility among eastern European and Italian immigrants. The Irish were always in your face and had a chip on their shoulders that never went away. The fact is they murdered the Welsh people in cold blood. Likening the molly magures battle with mining capitlaiists as an extension of the armed struggle in Ni between protestants and catholics was spot on. Does anyone know what kind of a weapon John Kehoe used? I live in the hard coal regions and have done a lot of research on the mollies.I live less than 2 miles from a murder site and know quiet a bit about them .Even though I own the movie the only thing true about it is some of the names.One example of the wrong done was the detective and Kehoe never worked in the mines together jack owned a saloon.The fight over card cheating happened the other way .Kehoe was not there and the detective was the accuser.The movie was made for hollywood.If you want a good history on the mollies read Lament for the molly Maguires by Aurther H lewis. I’ve seen this movie! We had to watch it in American History my junior year of high school. I actually kind of liked it, too (younger sean connery is hot). Especially how the Welsh hated the Irish so much that the mining companies made them the police force in mining towns. Didya know that? Actually this whole time period was the only part of the class I aced/paid attention to.